Oh, no! Benefit Foods currently doesn't have any offers on Vegan Cuts. However, check out our monthly boxes for vegan items delivered right to your door! Inspired by the lack of healthy, portable snack options available in grocery stores, California-based Benefit Foods was established in 2012 with a mission to create nutritious snack foods. 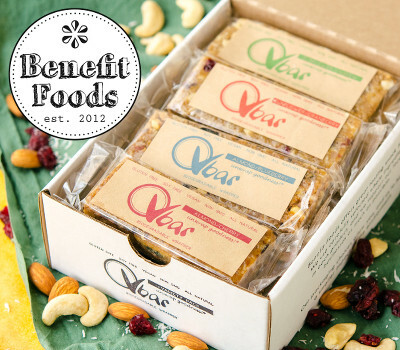 Vbar is their introductory line of wholesome, delicious snack bars. A focus on carefully selected whole ingredients, environmentally responsible packaging, and support for local businesses sets this company apart from the rest. Unwrap goodness! Follow Benefit Foods and get notified when they add new offers to Vegan Cuts.